2015 Jeep Grand Cherokee SRT with 24,377mi. Clean CARFAX - No accidents - Fully Serviced - QUALITY CERTIFIED up to 10 YEARS 100,000 MILE WARRANTY This Jeep includes: WHEELS: 20" Chrome Wheels Aluminum Wheels DUAL-PANE PANORAMIC SUNROOF Generic Sun/Moonroof Sun/Moonroof Dual Moonroof TRANSMISSION: 8-SPEED AUTOMATIC (8HP70) (DFK) (STD) 8-Speed A/T Transmission w/Dual Shift Mode A/T SRT HIGH PERFORMANCE AUDIO Premium Sound System REDLINE 2 COAT PEARL BLACK, LEATHER SEATS W/PERFORATED SUEDE Leather Seats Premium Synthetic Seats Bucket Seats ENGINE: 6.4L V8 SRT HEMI MDS (STD) 8 Cylinder Engine Gasoline Fuel *Note - For third party subscriptions or services, please contact the dealer for more information. * The Jeep Grand Cherokee SRT offers a fair amount of utility thanks to its advanced features and unique styling. It's also quite sporty, and injects an ample amount of handling chutzpah into the ridin'-high body of a family-friendly SUV. Excellence, luxury and stature are just a few of the pillars this car is built upon. When Jeep created this vehicle with 4 wheel drive, they immediately enhanced the performance ability. Easily switch between two and four wheel drive to take advantage of the improved steering and superior acceleration. This 2015 Jeep Grand Cherokee has such low mileage it has been parked more than driven. Marked by excellent quality and features with unmistakable refined leather interior that added value and class to the Jeep Grand Cherokee Where do you need to go today? Just punch it into the Jeep Grand Cherokee on-board navigation system and hit the road. Know exactly what you're getting when you take home this Jeep Grand Cherokee as past service records are included. If not for a few miles on the odometer you would be hard-pressed to know this 2015 Jeep Grand Cherokee is a pre-owned vehicle. 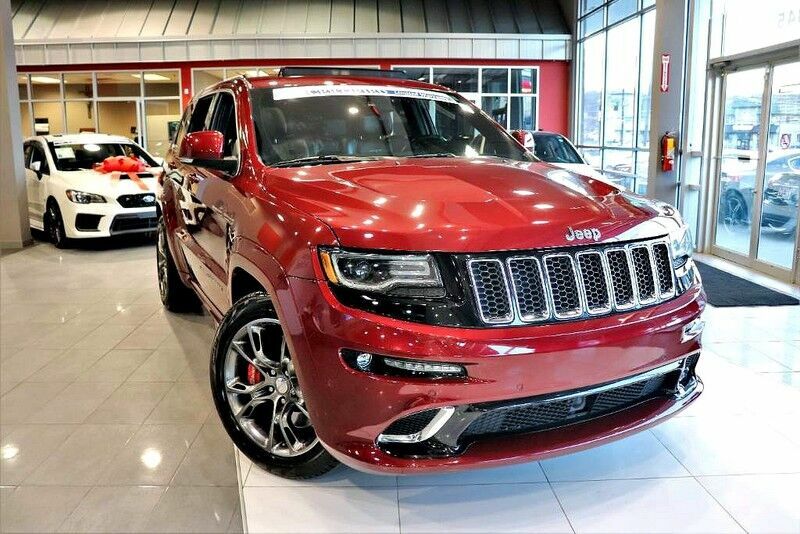 There should be no doubt in your mind about purchasing this 2015 Grand Cherokee SRT. This lightly-used vehicle is still covered by the Jeep factory warranty. Some vehicles are more of a need-to-have. This one is a absolutely-must-have. If it's looks aren't enough to persuade you, the feel of the powerhouse under the hood most definitely will. Treat yourself to a wonderful driving experience in this wel- optioned Jeep Grand Cherokee SRT. Equipped with the latest in driver comforts, this Jeep is the benchmark of modern automotive engineering. There is no evidence of prior damage or paintwork on this Jeep Grand Cherokee SRT. One look is all it takes to know what a find this 2015 Jeep Grand Cherokee SRT is. Amazing wheels help set this Jeep Grand Cherokee apart from other vehicles like it. More information about the 2015 Jeep Grand Cherokee: The Jeep Grand Cherokee has proven itself the premiere luxury SUV for 20 years. The latest Grand Cherokee builds on that tradition by offering civilized highway driving as well as the equipment to make a credible show off-road. The base Laredo 4x2 starts at just under $29,000 and comes very well-equipped. The top-of-the-line SRT's all-wheel-drive on-road performance rivals that of the Porsche Cayenne Turbo, but for half the price. Interesting features of this model are powerful engine lineup with diesel availability, True, proven off-road prowess, luxurious interior, and high-performance SRT variant No Credit / Bad Credit / No Paystubs, No problem !! ! All Approved ! Everyone drives ! CLEAN, GORGEOUS, LOW MILES, SHOWROOM CONDITION. CALL NOW QUALITY CERTIFIED up to 10 YEARS 100,000 MILE WARRANTY , To Certify a vehicle, there will be an additional cost for Certification. CALL NOW For details. STUNNING AGGRESSIVE LOOK ON THIS BEAUTIFUL--Call today to schedule a test drive... Good Credit/Bad Credit/No problem!!!! Get paid cash? No problem!! 100% Credit Approval with interest rates starting at 2.49% for qualified customers, our rates will not be beaten. We price our cars at wholesale price to guarantee the best deals for our customers. Our inventory moves quick, please call to confirm the availability of the vehicle of your interest; Springfield location 973-564-0112. This vehicle is located at our SPRINGFIELD location. Come visit our new showroom in Springfield NJ. This 2015 Jeep Grand Cherokee SRT is proudly offered by Quality Auto Center With this exceptional SUV, you'll get "sport," "utility," and comfort. Today's luxury vehicle is not just about opulence. It's about a perfect balance of performance, comfort and attention to detail. This 2015 Jeep Grand Cherokee is the perfect example of the modern luxury. This vehicle comes with 4WD for better traction on unstable surfaces, like snow and dirt to give you the edge over anything you might encounter on the road. The Grand Cherokee SRT is well maintained and has just 24,377mi. This low amount of miles makes this vehicle incomparable to the competition. More information about the 2015 Jeep Grand Cherokee: The Jeep Grand Cherokee has proven itself the premiere luxury SUV for 20 years. The latest Grand Cherokee builds on that tradition by offering civilized highway driving as well as the equipment to make a credible show off-road. The base Laredo 4x2 starts at just under $29,000 and comes very well-equipped. The top-of-the-line SRT's all-wheel-drive on-road performance rivals that of the Porsche Cayenne Turbo, but for half the price. Strengths of this model include powerful engine lineup with diesel availability, True, proven off-road prowess, luxurious interior, and high-performance SRT variant No Credit / Bad Credit / No Paystubs, No problem !! ! All Approved ! Everyone drives ! CLEAN, GORGEOUS, LOW MILES, SHOWROOM CONDITION. CALL NOW QUALITY CERTIFIED up to 10 YEARS 100,000 MILE WARRANTY , To Certify a vehicle, there will be an additional cost for Certification. CALL NOW For details. STUNNING AGGRESSIVE LOOK ON THIS BEAUTIFUL--Call today to schedule a test drive... Good Credit/Bad Credit/No problem!!!! Get paid cash? No problem!! 100% Credit Approval with interest rates starting at 2.49% for qualified customers, our rates will not be beaten. We price our cars at wholesale price to guarantee the best deals for our customers. Our inventory moves quick, please call to confirm the availability of the vehicle of your interest; Springfield location 973-564-0112. This vehicle is located at our SPRINGFIELD location. Come visit our new showroom in Springfield NJ.